Fires and burns kill hundreds of children each year and permanently scar thousands more. Yet more fire victims die from smoke than flames. Smoke can overwhelm a child or adult in minutes. How would you get out of your home in case of fire? How about your children? How would they escape from a second or third floor? Plan fire escape routes and practice them. NOTE: Show children who live in high-rise buildings the shortest route to a safe exit. Warn them not to use the elevator. · Know two ways out of every room in your house (doors and windows). · Stay low and go to the nearest exit. · Feel closed doors with the back of your hand (if hot do not open) go to the second exit. · Get out and stay out! · Have a meeting place outside away from your home. · Call 911 from your neighbor’s house. 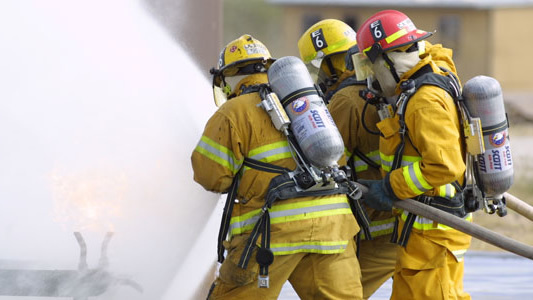 · Have a fire drill twice a year. · Conozca dos maneras de salir de cada cuarto de su casa (puertas y ventanas). · Gatee por debajo del humo y vaya a la salida más cercana. · Toque la puerta cerrada con la parte de atrás de la mano antes de abrirla (si esta caliente no la abra) vaya a la segunda salida. · ¡Salga afuera y manténgase afuera! · Tenga un lugar de reunión afuera, lejos de su casa. · Llame al 911 de la casa de su vecino. · Practique un simulacro de incendio con la familia dos veces al año. Install smoke detectors outside all sleeping areas and on every level of your home. Test them monthly following manufacturers' instructions. Change batteries at least once a year - even if they are still working. Caution: Never remove batteries for use in toys, a flashlight, or radio. 83 percent of all civilian fire deaths occurred in residences. There were 17,925 civilian injuries that occurred as the result of fire. 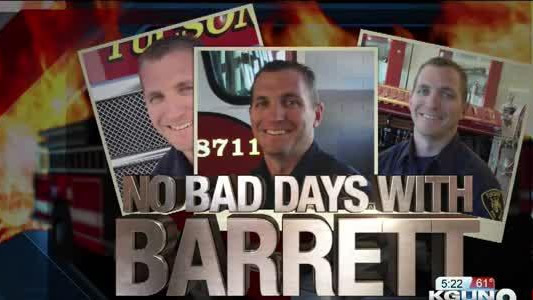 There were 115 firefighters killed while on duty. More fire victims die from smoke than flames. E.D.I.T.H. stands for Exit Drills In The Home. 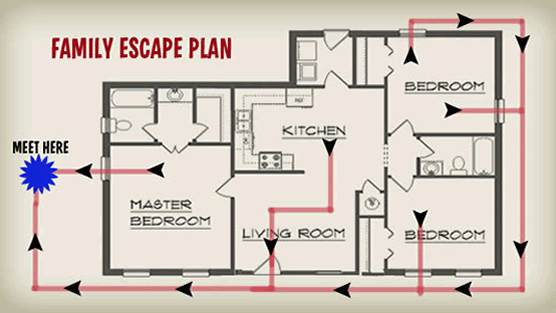 Having a planned route of escape could mean the difference between life and tragedy in the event of a house fire. Never remove batteries for use in toys, a flashlight, or radio. Test how "hot" your hot water is. Turn on the hot water at the tub faucet. Let it run for 3 to 5 minutes. Set the water heater's thermostat to low, warm, or 120oF. Wait a day. Test the water again. Repeat, if necessary. Your clothes and dishes will get clean at this setting! Install anti-scald devices in your shower and bathtub fixtures that stop the water flow when the temperature exceeds 120oF. Always check the water temperature before placing your child in the tub. A child's skin burns more easily than an adult's. Supervise kids in the tub. Young children can turn the hot water on by themselves. Older children can scald a younger child. Never apply anything but water to cool a burn. Applying other items could result in more serious injury and/or permanent scarring. NOTE: If you rent, ask your landlord to lower the water temperature or put an anti-scald device in your shower and bathtub fixtures. Keep hot foods and drinks away from the edge of tables and counters. Do not put them on a tablecloth that little hands can yank. Keep your child away from the stove. Turn pot handles toward the back of the stove. If possible, use rear burners. Watch for dangling appliance cords on crock-pots, irons and other appliances. 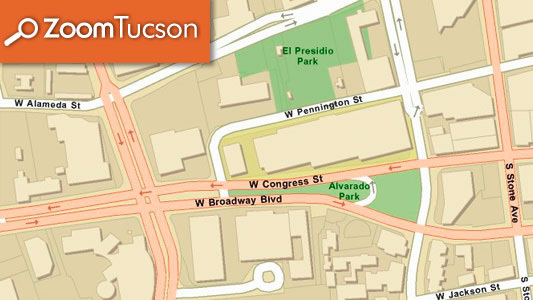 The dry, mild climate here in Tucson is by far one of our greatest assets, however the dry weather greatly increases our risk for brush fires. Taking simple steps to fireproof the perimeter of your home could prevent costly property damage, and could potentially save lives. Trim branches that overhang your house. Trim the branches back to at least 10 feet from your house. This is especially important near your chimney and heater vents. If you need to trim branches or remove trees near power lines, call TEP prior to trimming. This will save you time and money in the event of a mishap. Clear your property of brush to 30? from the house or to the property line on all sides, whichever is closer. This does not include plants and bushes that make up the landscaping around your house. Brush fire spreads rapidly from the ground to the trees if there is an abundance of undergrowth. Clearing the brush will add value to property by providing a buffer of defensible space and will keep your property attractive and looking well maintained. 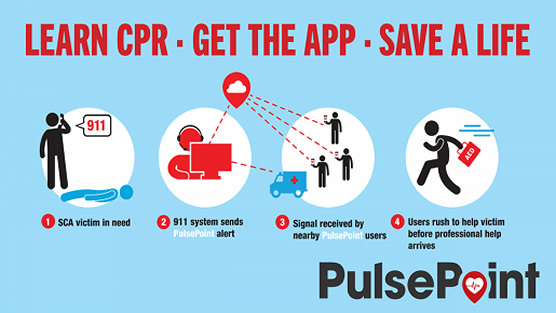 PulsePoint is an AMBER Alert-type notification for a Sudden Cardiac Arrest. 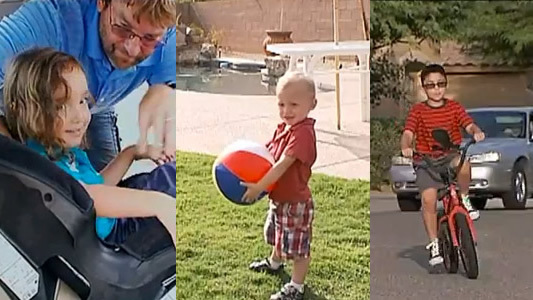 Car Seat Safety. 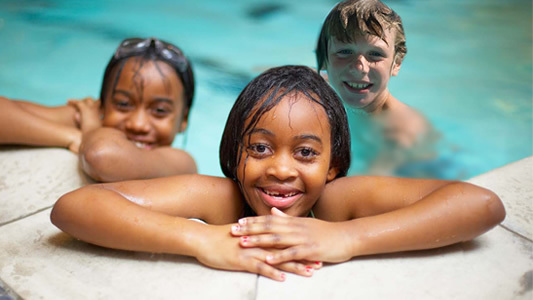 Pool Safety. Bike Safety. Do you know the ABC's?